We are developing a simple and useable app for making notes on Mac: Alternote. It has full Evernote API support and is launching soon. I wanted to show you sneak peek of its design and features: alternoteapp.com. What is your opinion about it? What features would you want to have in a note-taking app? Write a comment, if you want to take part in beta-testing the app. Looks good. Any plans to bring this for Windows? Hey! I would love to beta test the mac version of alternote. I am in need of a note taking app just like it! Hi. One of the problems I have with the current implementation of Evernote for the Mac is that while it mostly supports BiDi using Apple's text editing mechanism, it absolutely does not allow saving the unicode characters 200E and 200F, which are necessary for certain corrections of directionality. Will Alternote support BiDi (at least at the level offered by Apple's text services) and allow these characters or is it limited by the fact that it's based on Evernote's storage mechanism? Another missing feature in Evernote is better control of table style. That is, allowing changing table width, column width, background colors, spacing, borders etc. Will there be support for that in Alternote? Christmas has come and gone.. any updates for windows? What does Alternote do that I can't do by simply typing my note directly into EN? Can you say if Windows client is on plans at all? Please answer, no one likes being left in the dark. 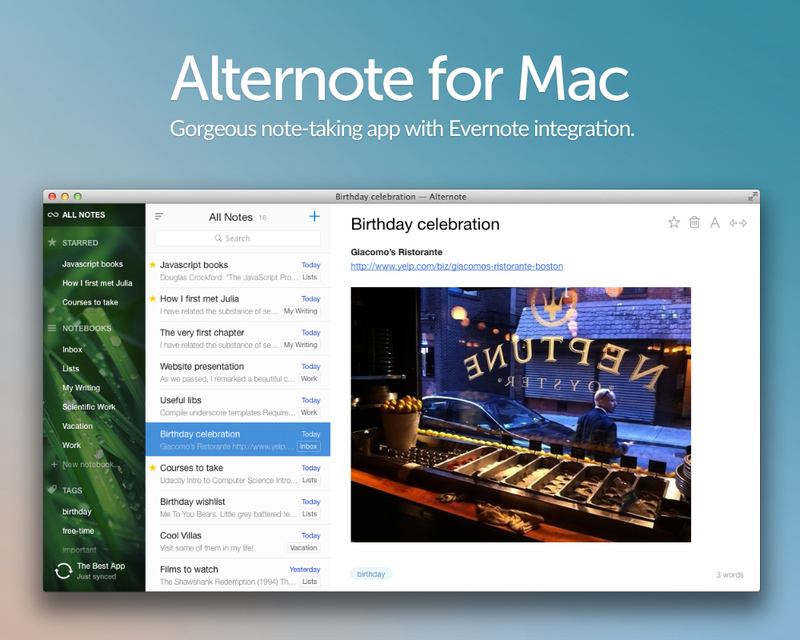 Alternote has already launched long since for Mac, and seems to be quite successful. Their website mentions that they have plans for an IOS client, which was also confirmed to me by them on Twitter. I don't think they have plans for a Windows client at this moment. In all seriousness, are there any plans for a Windows client, or has that been scrapped. Please just let us know, I just want to know.